Yesterday, the Labour Party and SIPTU celebrated the life of James Connolly with members of the extended Connolly family. We began the day with a service in the Capuchin Friary on Church Street where special guest President Michael D. Higgins addressed a combined group of trade unionists, members of the Connolly family and Labour Party Members. We were then led by the Irish Citizen's Army and the Dublin Fire Brigade Band from Church Street to Arbour Hill. Party Leader, Joan Burton made her annual oration to members of Labour, trade unionists and the Connolly family. Today the Executive Board of the Labour Party opened up nominations for the Labour Party Leadership and Deputy Leadership. General Secretary Brian McDowell has made the following arrangements which the Executive Board has approved at their meeting on Saturday May 14th 2016. "In light of the the Party Leader's statement on Tuessday 10th May I am now proceeding to make arrangements for an election for Leader and Deputy Leader. 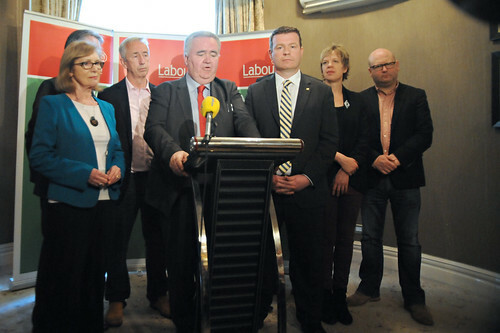 Earlier today our Parliamentary Party Chairperson, Willie Penrose launched the Labour Water Charges (Fair Treatment of Customers Bill) 2016. This Bill will ensure that, in the event of water charges being suspended, there should be fair treatment as between the majority who paid their water charges and those who did not. This Bill provides for the full refund of monies paid by customers who had complied with the law within 6 months. Suzy is a former Clery's employee and following her work on the Clerys workers campaign she decided to join Labour. If like Suzy you believe in standing up for working people you can join us here! Andrew-one of our new members out in Dublin Mid-West tells us why May Day is such an important day for the labour movement. May Day is celebrated as a workers' holiday throughout the world. The Labour Party introduced the May Day public holiday in 1994. Increased the minimum wage - twice. While much has been achieved the fight for workers continues. We believe that the next big issue for workers is a Living Wage. We believe that everyone who is working should earn enough to live on. We support the introduction of a Living Wage of €11.50 per hour. If you would like to join our campaign get involved here. Like us on Facebook, Follow us on Twitter. Today, our Party Leader Joan Burton spoke in the Dáil about a possible British Exit of the European Union. The Tánaiste spoke about the benefits of being a member of the European Union and said that the Union is better and stronger together. The EU has been an essential force not just in building peace, but spreading democracy. Similarly, it has been an essential force not just in promoting prosperity, but equality and human rights. It was the EU which put equal pay on the agenda, the EU which prioritised the rights of people with disabilities. Labour Youth wants to see all people paid the same rate of pay for the same work. People's pay should not be subject to discrimination on the grounds of age or gender. We believe that it is crucial in the fight for equality that equal work deserves equal pay. Last weekend our Party Leader Joan Burton spoke at the Women in Media Ballybunion Conference. The Tánaiste spoke about the issues female candidates had to overcome in the General Election, the lack of female voices in ongoing Government negotiations and sexism she faced in the media through out the General Election campaign. Our Head of Online, Shauneen Armstrong also spoke at the conference over the weekend outlining the role social media played in ‪#‎GE16‬ and the role social media will have in political campaigning going forward. Aodhán Ó Ríordáin is our Seanad candidate for the Industrial and Commercial Panel. Read more about his campaign below. I believe in a more tolerant, more equal, and more diverse Ireland. I am ambitious for our country and I want to continue to champion the ideas that I pursued as a Minister of State. Crucially, I want to continue my work on drug policy reform. I believe that we must ensure that addicts are given respect and appropriate access to treatment. I fundamentally support the appropriate resourcing of the local and regional drugs task forces and believe that it is important that drug addiction is treated at a local level with local services.